Chocolate: our guide to choosing and tasting chocolate. How do we recognise a good chocolate? What is a "pure origin" chocolate? What are the chocolate tasting rules? This month, La Grande Épicerie de Paris invites you to rediscover an essential of French gastronomy: chocolate. From the choice of cocoa beans to the expertise of chocolate-makers and roasters... Discover without further delay our advice and tips for choosing it, appreciating it and, of course, cooking it. If cocoa culture dates back to the Mayas, we nonetheless had to await the XVI century before cocoa made its way to Europe. First introduced by the explorer Cortés on his return to Spain, in just a few short years it became the delicacy of kings, highly sought after by the greatest of royal courts and enjoyed as either hot chocolate or as more refined confectionery. Already such a success, cocoa hadn't even begun to reveal its full potential. Since the XVIII century, it became increasingly democratised by Swiss chocolate houses like Cailler. It came to be processed in a thousand ways, from the first fondant chocolate perfected by Lindt to the first bar invented by Joseph Fry. A great chocolate first requires quality beans which carry the first taste markers. So chocolates coming from Peru, Madagascar or Venezuela develop nuances that are respectively more woody, more rounded or touched with a light acidity. In this line, the "pure origin" chocolates, that is, those made only with beans from one country or region, guarantees flavours that do justice to their lands as well as to the expertise associated with them. Even more specialised, the "estate" chocolates, " come from beans grown on the same plantation. As Patrice Chapon, chocolate-maker and roaster, summarises, "it is the 'crème de la crème' of chocolate, like a prestigious vintage from a great vineyard. Most are, in fact, given vintages. " • the chocolate-makers' and cocoa roasters' expertise. Once the beans are chosen, there follows a long process of transformation into chocolate. The main steps include sun-drying the beans or roasting them to diffuse their aromas. At the end of the process, conching is a process of refining the chocolate by stirring it, hot, for several hours with the two essential complementary ingredients: sugar and cocoa butter. In view of the numerous subtleties that have such an effect on the creation of good chocolate, some chocolate-makers including the house of Bonnat, Chapon or Pralus have chosen to handle every stage of production. A de facto part of the overall "Bean to Bar" process, these experts select and roast their own beans. A sure sign of quality for any amateur, keen to learn the large palette of flavours that chocolate can offer. Finally, as Patrice Chapon reminds us, the secrets of a great chocolate made with exceptional raw materials resides, naturally, in the simplicity of its composition. "Making chocolate requires only three ingredients: cocoa paste, cocoa butter and sugar. If you see a long list of ingredients with complicated names, steer clear and choose another, more authentic, chocolate! " As with wine, tasting a good chocolate solicits all five senses. Here are the steps to follow in appreciating all the richness of chocolate. You can more easily differentiate and memorise the nuances of each origin with our sampling box sets. 1- Appearance: Start by observing its shine or satin appearance, its more or less uniform colour and the regularity of its shape. 2- Crispness: Listen to the crisp of the chocolate when you break it; « clean, it can still vary depending upon the type of chocolate. The crunchiness of a praline will be different if it contains caramelized hazelnuts or lace crepe » says Patrice Chapon. 3- Aromas: then smell all the aromas emanating from your chocolate bar. Are they more spicy, floral or fruity? 4- Texture: on contact with your palate, experience all the richness of the texture of your chocolate as you prepare to bite into it. Thick or thin, perfectly smooth or irregular, every detail counts. 5- Taste: Finally, taste your square of chocolate by letting it melt for several minutes between your tongue and your palate so it reveals its subtlest notes, those contained in the cocoa butter. Choose your chocolate, learn to taste it... and know how to cook it. Explore a new field of opportunity presented by chocolate with our vegan chocolate cookies recipe. A real taste enhancer, fleur de sel highlights all their finesse without detracting from their tastiness. 1) Melt the chocolate in a bain-marie. 2) In a bowl, mix the flour, cocoa, baking powder, half the fleur de sel and the sugar. 3) Make a well and add the dark chocolate and margarine, cut into small cubes. Mix until you have a smooth dough. 4) Make 28 g balls and place them on a baking tray covered with baking parchment, without squashing them. Sprinkle over the rest of the fleur de sel. 5) Bake in the over at 180°C for 10 mins. Allow to cool on a wire rack. This gift set features 10 of the world’s best cocoa beans in 50-gram bars: Papua, Indonesia, São Tomé, Trinidad, Venezuela, Tanzania, Ghana, Madagascar, Colombia, Ecuador. This rare and delicate chocolate bar is produced in very small series from cocoa grown in the wooded hills on the edge of the central highlands of Vietnam between Madagui and Bao Loc. A chocolate with an intense but balanced flavour made from cocoa beans from Ben Tre island in the Mékong Delta, where cocoa trees grow in the shade of coconut palms. This dark chocolate has a powerful nose with notes of liquorice and cinnamon with tangy, floral notes on the palate. A dark chocolate with an aromatic persistence, with flavours of candied citrus fruits, and notes of fruit, wild mushrooms and dried figs. This chocolate has a fruity taste with an aromatic intensity that lasts on the palate and spiced and acidic notes. Gift box of 52 Origine dark chocolate squares: Alpaco 66 % cocoa, Tainoiri 64 % cocoa and Manjari 64 % cocoa. Milk chocolate with Piedmont hazelnuts. 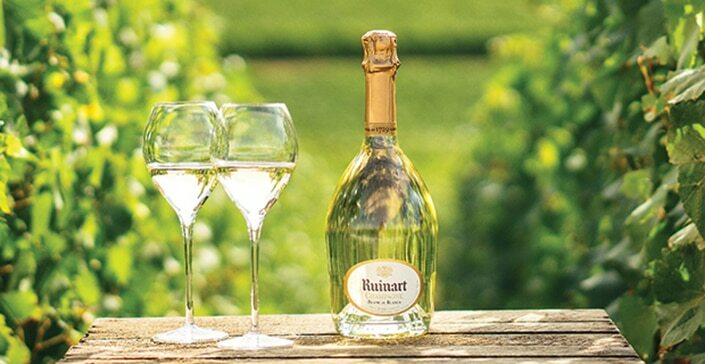 Party champagne: choosing it, pairing it and tasting it.